On the eve of the MTV Video Music Awards, Billy Corgan was busy preparing for his new Chicago-based teashop, Madame Zuzus. This might seem odd among certain circles of people who remember when Tonight, Tonight won the Video of the Year Award in 1996. Influenced by Georges MéliÃ¨s silent film, A Trip to the Moon (1902), the video emblematized how the Pumpkins drew striking constellations of hope from the black-and-white weariness of life. Their videos transmuted escapism into adventure. 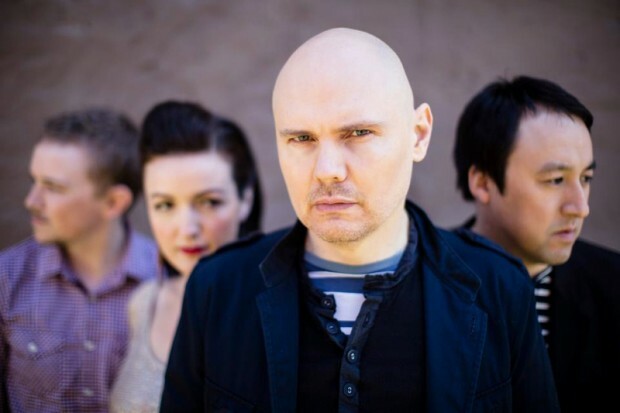 The Smashing Pumpkins were distinguished from their grunge rock contemporaries for their strong melodicism tethered to equally ornate visual worlds. Whether those worlds were crafted through the camera lens or Corgans lyrical imagery. From the acidic rumblings of Gish to more commercial successes like Mellon Collie and the Infinite Sadness, a rock band never so elegantly cinematized isolation and self-deception as the Pumpkins. Although the popularity of music videos has diminished since the late 90s, Corgans theatrical acumen has not. This fall, Corgan & Co. will introduce their galvanizing new album, Oceania, to the stage with amped production that features luminous projections on a mammoth, floating sphere. Enlisting the people responsible for Roger Waters The Wall tour, Oceania is poised to be the Pumpkins most visceral undertaking in years. Perhaps this explains why the thin varnish of the VMAs is of little concern to Corgan anymore. Over the last 15 years, Corgan has collected everything from tea to Tequila. A glutton for a torrid Twitter fight as much as real life wrestling, the contemplative conductor, our veritable moon man, has not, however, collected any dust. During our conversation, the savvy, discursive frontman discussed the difficulty of expectations, the Dead, and giving nineties nostalgia a firmly upright, unswerving, middle finger. I wanted to start by asking how Roger Waters production team contributed to the Oceania tour. What compelled you to pursue such a visual direction? Well, our soundman is this guy Jon Lemon, who knows Sean Evans, who worked with Pink Floyd in the past. I know Roger as a friend, so it was just one of those things where I saw the tour as kind of blown away with visuals. When we were recording the album, we discussed whether we were going to play the album in full, which Ive always kind of wanted to do. But we need something theatrical to happen  instead of just having people sit there, who werent familiar with the new songs at all. The modern age has really quickened the pace of the concert. Five minutes can seem like a really long time if what youre doing isnt engaging the audience. On the other hand, touring gives you a unique opportunity to hold an audience captive for at least two hours. Right. 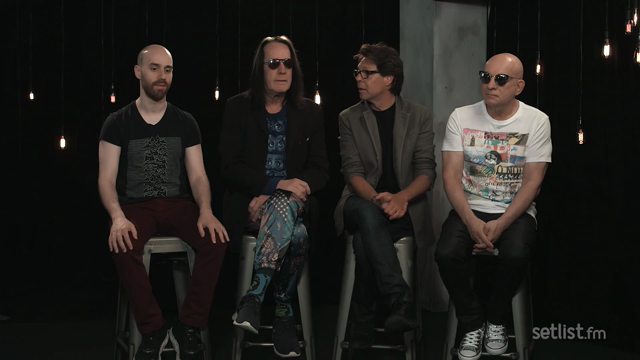 So, the first hour is going to just be the album Oceania, with the stuff Sean and his team did, which is pretty cool. 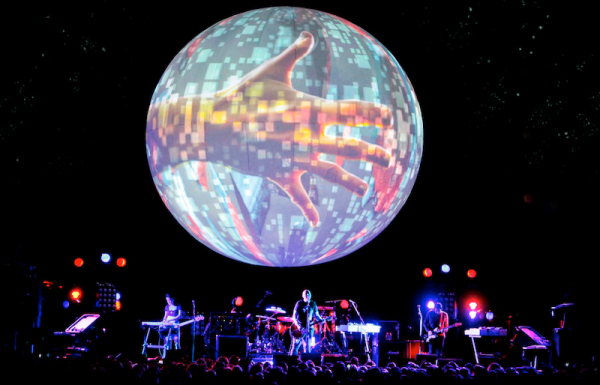 [The visuals are] projected on a 25-foot sphere thats above the stage. It looks pretty epic when you see it live. Weve been very happy with it and actually, kind of had to invent new technology for it  3D mapping around the sphere so the images dont blur. Its been an interesting process. I said that I had an idea, and everyone said it wasnt going to work. [Originally,] even Sean came back and said hed looked into [3D mapping] for Roger Waters tour and couldnt do it. Now, someone invented what was needed to make it happen. It adds a regal atmosphere to the night, which is cool because when we break off in the second half and play a little more aggressively, you can kind of feel the gears shift. Its nice because the concert doesnt feel like one long monologue. It seems like its in two parts. What was your idea that no one thought would work? Its hard to explain, and Im not a technical person. But if you have an image and project it onto a sphere, like a face, it will blur around the images. Now, they actually have a computer correct the blurring, so when you project [the image], it doesnt blur. Sean put together all these interesting visuals that are more symbolic. Its not a movie. We didnt want people just watching T.V. To what extent is the enhanced stage production on this tour like a live music video? Did you ever consider making a video for Oceania? You know, I really would love to make a video. The problem is, no one can tell you anymore that a video sells anything. At least in the old model, theyd say: Okay, heres half a million dollars and we know well get it back if we get this thing on MTV. Today, can spend $100,000, which is no small amount of money, and people could say its no good  that its not as good as your old videos  and then you dont sell anything. So its kind of like, why are we spending all this money and putting in all this effort? Id love to make videos. Whats difficult for me is that a lot of recent stuff Ive done gets compared to the past when the budgets were much bigger. I dont look at it in a pessimistic way; I think you just have to be more creative. That difficulty is kind of ironic, given the accessibility of video technology, YouTube, and other forms of viewer culture today. Yeah, you know, part of my maturation in the world  and me being a little bit more peaceful  is accepting the different parameters at play. Id love to continue to make videos. I have a good track record and good ideas all the time. I just dont see where it makes a lot of sense. Record companies dont want to put up the money, but theyd be happy if you put up your own money to do it. What is it like to play live when half of the other bands touring cite the Smashing Pumpkins as an influence? I dont know, its kind of like when someone gets a lifetime achievement award and they get up and say Im not dead yet! I feel like the epitaph of my musical life isnt written yet, but Im very flattered where people cite influence and where I can see influence where its not cited. I think it helps correct some peoples overly negative views of my musical past and, in some ways, my musical present. I just think the long-term legacy of what Ive done musically means more in a direct value system than the trendy stuff. So, over time, it evens out. Is there a danger in people being happy to hear you? I find that really uncomfortable. Once I realized, in 2007, when we came back, that people were on a sentimental death trip, I spent basically the next two years destroying that. [It] hurt a lot of business stuff and had a lot of people scratching their heads. But it was a bit of a scorched earth policy, because I wanted to break down certain things [in order] to rebuild them into something real. I think the period that were in now is a direct result of our willingness to go through scorched earth policy. I dont see a lot of other people doing it and I understand why  the economics, the attention span, the YouTube clips, the comments on your Twitter  it adds this weird peer pressure. Some people are like, Why cant you just get along? And I dont want to get along. Right. Nobody wants to go from winning the gold to being given a consolation prize just for showing up. Thats kind of what it feels like! You know what I mean? I still think Im a fairly attractive artist today. I think my music is contemporary, I think my style is still forward-leaning. I can still write a good song, I still have interesting things to say, I add to the culture in different ways besides just music. I dont get the [notion behind] This guy gets to play in the sandbox and you dont. The delineation between those is not fan satisfaction; its hit songs.